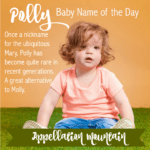 Molly started out as an affectionate form of the enduring Mary, a spunky nickname form that now stands on its own. Thanks to Kristin for suggesting our Baby Name of the Day. We can’t talk about this name without discussing Mary, that long-time #1 name for girls. Long before the internet, parents chose from a smaller list of possible names. To distinguish your daughter Mary from your sister’s daughter Mary and your aunt Mary, a wealth of nicknames evolved. The path zigs and zags, but Mary became Mare and Mal and Mally, which led to Molly – and eventually Polly, too. Plenty of names dropped an -r sound for an -l – think of Harold’s Hal or Dorothy’s Dolly. This means we can’t say with confidence how many women have answered to Molly over the years, as many of them were recorded as Mary. The numbers suggest it was more than a few. After all, Mary was the #1 given name for girls in the US from 1880 right though the 1950s. Molly appeared in the rankings, too, hovering around #400 for most of the same time period. Mollie – spelled with an -ie – was far more popular for much of that time. Only as Mary started to fade did Molly rise. The name entered the US Top 200 in the 1970s, and reached the Top 100 by the end of the 1980s. It spent over twenty years in the Top 100, outpacing Mary. That makes this name a quiet favorite, used steadily over many years. One of the most famous bearers of the name was born Margaret – and known as Maggie in life. Socialite Margaret Brown boarded the ill-fated maiden voyage of the Titanic, and later organized life boats as the ship sank. Afterwards, she argued that they should turn back and look for survivors. The nickname came courtesy of a semi-biographical 1960 Broadway musical, first performed well after Mrs. Brown’s 1932 death. The “unsinkable” title lends the name a certain spirit and gumption. One more to consider: Mrs. Mary Hays, known as Molly Pitcher. During the American Revolution, she served by her husband’s side in several battles. She started out as a nurse and general camp housekeeper, but when her husband was injured, she took his place at the cannon. Pitcher was immortalized on a US postage stamp in 1928. There’s a second similar story, with a Margaret “Captain Molly” Corbin. Corbin became the first woman in US history to earn a military pension. Plenty of other notables come to mind: writer Ivins, William Gibson’s cyborg-assassin in Neuromancer, an American Girl doll from the World War II era. But today’s parents probably think of two figures. It’s the name of James Joyce’s Penelope figure in Ulysses. Her full name is Marion. Outspoken columnist Mary Ivins, better known as by the nickname. We can’t forget 1980s teen queen Ringwald. There’s a World War II-era American Girl doll by the name. It’s the first name of Harry Potter matriarch Mrs. Weasley. One of the early American Girl characters is World War II era Molly McIntire. On a fierce note, Molly Millions is an assassin, a mercenary cyborg, in William Gibson’s Neuromancer series. There’s something slightly Irish about the name. Part of that comes down to use, but there’s also the Molly Maguires, an Irish secret society big in the Pennsylvania coal mining region in the 1870s. Part-fraternal organization, part-early union, stories about the origin of their name vary. In some cases, the group formed to help a widow by the name, whose plight inspires the organizers. In other tellings, she owns the tavern where the group first met. It’s another reason this good girl picks up just a little bit of edge. And one more: back in the day, “gun moll” referred to a gangster’s girlfriend. If this names makes you think “Good Golly,” credit Little Richard. Legend says that he borrowed the phrase from a DJ named Jimmy Pennick. Either way, the 1958 classic remains an iconic rock and roll song all these years later. Other songs include the name, too, like a 1995 homage to Ms. Ringwald. There’s also Flogging Molly, a Celtic punk band with a dedicated following. With all of these positives, why is the name slipping? Maybe that comes down to another slang use of the name. The drug MDMA – or something similar – is sometimes referred to by the name. If you’re high on the drug, you’re rolling on molly. It’s just enough of a concern to give parents pause. Overall, this name feels informal and sweet, but also energetic and even gutsy. It’s every bit as wearable as other casual favorites, like Sadie and Millie, but feels like more of mainstream favorite than a vintage revival. As for the drug reference? 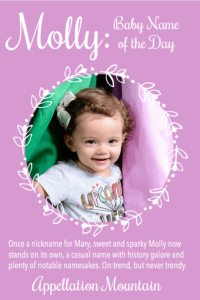 Molly has endured other slang uses, and with figures like Ringwald, Weasley, and the unsinkable Mrs. Brown, it’s a safe bet that we’ll be hearing this name for girls for generations to come. What do you think of Molly? Do you prefer it as a nickname for Mary, or does it stand on its own? And do you think the drug reference is a long-term problem? 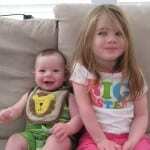 Originally published on November 8, 2012, this post was revised and re-posted on January 31, 2018. I feel like the drug reference is only becoming more popular (probably because the generation who first were affected by it are now parents). It would be the equivalent of naming a daughter Mary Jane (whose lovely name now adorns pot stores in all the states that have legalized marijuana). Too bad the name Roxy is getting this fate, too. Speaking as a Molly, I’d just like to say: it’s cute and spunky, yes. However, I’ve always hated it. I don’t WANT a cute name; I want a beautiful, dignified name with some gravitas. something that’s not childish. We named our newly-adopted molly cat Mallaidh, a Gaelic spelling of Molly. 😉 She was born at the shelter and they named her Merry. My sister-in-law’s late cat was named Mary Jane and I didn’t want to hurt or confuse my young niece and nephews by calling our girl something so similar, but I didn’t want to change it too much either so we went from Merry to Mary to Molly to Mallaidh. I didn’t find out about the molly/tom cat thing until afterward, so the name seemed even more perfect. She’s a sweet girl and Mallaidh just suits her so well. A girl I went to school with named her oldest Molly — her baby sister is Add!son — I *think* those names were chosen because she’s a fan of the Chicago Cubs and the band Flogging Molly. I think of “Sweet Molly Malone” – and of my formidable geography teacher, a Mary Margaret who went by Molly. (Incidentally, I know a Margaret Mary who goes by Mimi – cute!). Another in the genre is Lolly for Laura – but that one seems to have died out! Growing up (admittedly in India) I didn’t realise that Molly was still a name in use. Imagine my surprise when I encountered an adult Molly at age eighteen when traveling in Australia (the girl in question was American). Then I discovered that it’s actually a fairly popular name in some places. I know this sounds silly, but for me it was like suddenly realising that unicorns are exist. I like the name, but it still has a sort of fairytale essence for me — like I couldn’t use it without feeling slightly foolish. Ah, I love Molly. Sweet and a little bit saucy. I’m actually reminded of Molly from the movie Uptown Girl. I love Molly. The husband and I had somewhat of an epiphany where baby girl names are concerned a couple weeks back, and we finally have a top name and backup that we both love. Virginia Sue is tops, while Molly Ramona is the backup. Both middles are after my grandmother, Ramona Sue, who lost her battle with lung cancer last January. Her daddy liked to call her Sue. Virginia won out for honoring my great-great Aunt Virgie who will be celebrating her 102nd birthday on New Year’s Day, but also because it has more options than Molly. That is Molly’s downfall to me. It’s spunky and sweet, but has no wiggle room. Molly has been growing on me a lot lately. My grandmother is Mary but has always gone by her middle name Nell. Another Mary associated with my family makes the name too unusable to me, but Molly is a sweet and just uncommon enough alternative. 🙂 It also fits with a lot of the other nickname-y names on my list: Edie, Rand, Wiley & Molly. I used Molly for my Boxer, and it fit her well. She was so playful and vivacious. I love the name, and any time I hear it now, it reminds of my sweet girl. I adore Molly and used it for one of my characters. I’ve always imagined a Molly as being a very strong and graceful woman – a steel magnolia. I like molly as a nickname for Marigold. Molly is great, but I don’t think it ages well. I know several 20-something Mollys, and it just seems odd. I love it for a kid, but not a grown woman. We already have a Maria and my niece is nicknamed Mallie… so it’s out for us, but I really like Molly. Like Minnie and Milly, I’d prefer Molly be a used as a nickname for something more “grown-up”, but it’s very charming. I like Molly a lot. My mother despises the name. She had a shrew of an aunt named Molly. I think she would disown me if I ever used it. Molly’s a sweet name. The cat association makes it even sweeter to me.